To quickly review status and metrics for your cloud infrastructure, cloud instances and VMs in the Orion Web Console, click Dashboards > Cloud to display the Cloud Summary page. You can also use this page to drill down and display specific details about a cloud instance or VM. Use the Search Instances field to find instances and VMs quickly. Click hyperlinks to access more details and hover over points to compare collected data and linked alerts. 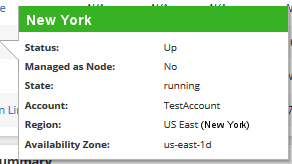 To review the status and metrics for a specific cloud instance/VM, hover over the name of cloud instance/VM to display details about it. 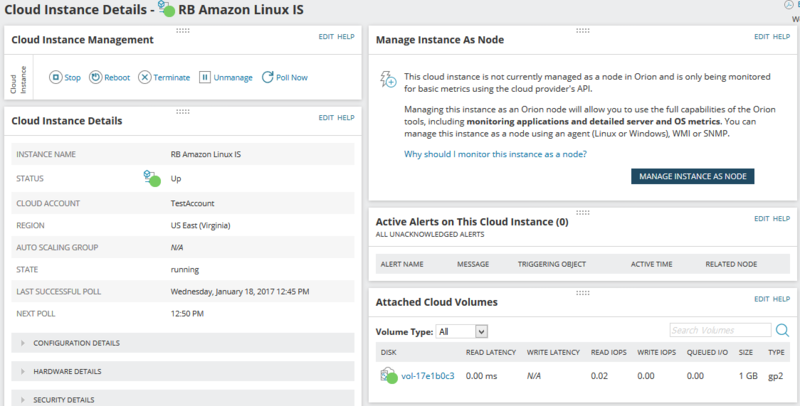 Active Alerts lists active alerts affecting the cloud instance/VM. Min/Max/Average of Average CPU load displays average CPU load collected and calculated for the cloud instance/VM. Min/Max/Average of Network Utilization provides a chart of the minimum, maximum, and average bits per second transmitted and received over a cloud instance/VM for a custom period of time.